What an amazing Spring season it is for the horse racing enthusiasts. In beginning of May, the Kentucky Derby will take place, but before it is time for all the Grand National races. The biggest of the three came from Aintree at the start of April and was won by Tiger Roll, but the next two come from Scotland and Ireland. 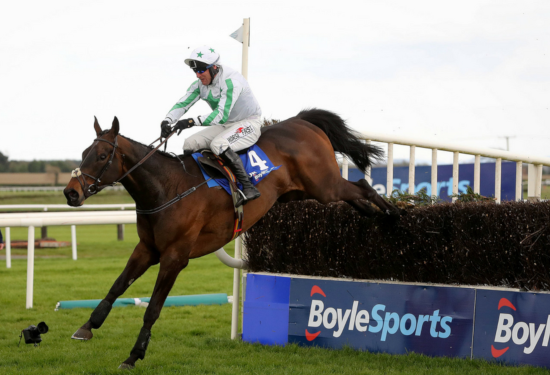 The Irish National presents a real chance at redemption for a host of runners and riders after a disappointing race in Liverpool. The three-day festival takes place over the Easter weekend at Fairyhouse, but this is the featured race. The race is scheduled for Monday 22nd April, and the winner will receive the £250,000 prize money. The race consists of a distance of three-miles-and-five-furlongs with 24 fences for the runners to jump. But, who should punters be putting their money on? The horse that should be right in contention to go better than their performance at Aintree is Willie Mullins trained Rathvinden. It was heavily fancied to be the leading contender to Tiger Roll at Aintree and despite running prominently; came up short. It has initially declared for this race but could still pull out; meaning most bookmakers are offering a hugely attractive 12/1 on the 11-year-old. Ruby Walsh rode him brilliantly in the National and would have been much closer to winning the whole thing had it not been for the remarkable Tiger Roll. However, it proved at Aintree that it could travel well over the bigger fences, and stayed well. It would be the perfect end to the season for him, after winning at the same track at the end of February. Now would present the best chance of getting the ultimate value for punters, as he is sure to drop in price as the race gets closer. One of the biggest surprises from Aintree came in the form on Magic of Light trained by Jessica Harrington and rode by Paddy Kennedy. Set off at an incredible 66/1 for the National at Aintree it wasn’t given much hope. However, it performed wonderfully and showed all the potential that it posses. It never looked in danger when travelling over the big Aintree fences and ensured that Tiger Roll was made to work for the win. This wouldn’t have come as much of a surprise for Harrington, as the horse has been progressing very nicely all season and it yet to fall. It did unseat Robbie Power at Fairyhouse in February, but that was an unfortunate occasion when other horses impeded her in the race. The eight-year-old was the closest that a mare has ever come to winning the biggest race of the racing calendar, and was the first time that Harrington had trained a horse for the race. If that is the starting point, the Irish Grand National could produce a memorable afternoon. Currently priced by most bookmakers as a 14/1 chance, it could be a wise investment. It has at least placed on all-but two of her runs this season; winning on two occasions. Rebecca Curtis trains this Michael Sherwood owned horse, and he was one of the big market movers in the build-up to the National. He almost didn’t make it at all and scraped in as the number 40. The main reason why punters chose to back this ten-year-old was the fact that it was a winner of the Scottish Grand National the previous year. The Aintree National was always the target for Curtis, and Joe Farrell went into the race fresh. However, despite possessing the jumping and staying ability that is needed for a National, he showed none of that on the day. He was pulled up two from the finish after dropping back through the field. He is yet to win this season; having come second and sixth at Newbury on 23rd March and 2nd March respectively. However, his Scottish National win shows that he has the ability, and at a 25/1 price in most horse racing betting markets ; he could present a fantastic each way bet. This entry was posted on Friday, April 12th, 2019 at 4:14 am	and is filed under Horse Racing. You can follow any responses to this entry through the RSS 2.0 feed. Both comments and pings are currently closed.